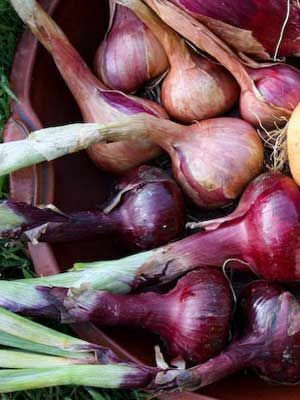 Mix a balanced organic fertilizer into the bed or row before planting your onions, taking care to get it into the soil below the plants. Do not feed plants that are nearing maturity if you want very sweet onions. Beet, Carrot, Swiss Chard and Cabbage. If you don't start your own seeds, set out sets (small dormant bulbs) or pencil-size seedlings in spring, while the soil is still cool. Onions respond to changing day length. Grow short-day varieties in southern latitudes. Long-day varieties work best in northern areas. Try growing different varieties from seed to explore differences in bulb color, size and shape. Harvest young onions as scallions. When bulbs form and the tops of the plants fall over, pull them and cure in a warm place for about 10 days before storing.